Do not let the small mistakes in this article about the ordination of six former Anglican clergy as Catholic priests for the Personal Ordinariate of the Chair of St Peter distract you -- this article in the Fort Worth Star-Telegram entitled "6 former Episcopal clergymen are ordained in Catholic Church" is one of the few I have seen that "gets religion" and understands the big picture being covered in this story. And that story is -- these priests are entering the Catholic Church, not leaving the Episcopal Church. Yes, I know the six priests in question have left the Anglican world for Rome -- "Swimming the Tiber" in church parlance -- (but as the Trinity River runs through Fort Worth I have changed the phrase somewhat). But the real story is about a journey to something -- not a rejection of their past. Before I go to deep into this article, let me say up front that I am acquainted with some of these priests -- and have known the leader of the ordinariate, Monsignor Jeffrey Steenson for 10 or so years. And, I am a priest of the church where these men began their ministries and I have written about the journey these men have taken for a number of church-related publications over the past few years. The bottom line is that I come to this story with some degree of knowledge. 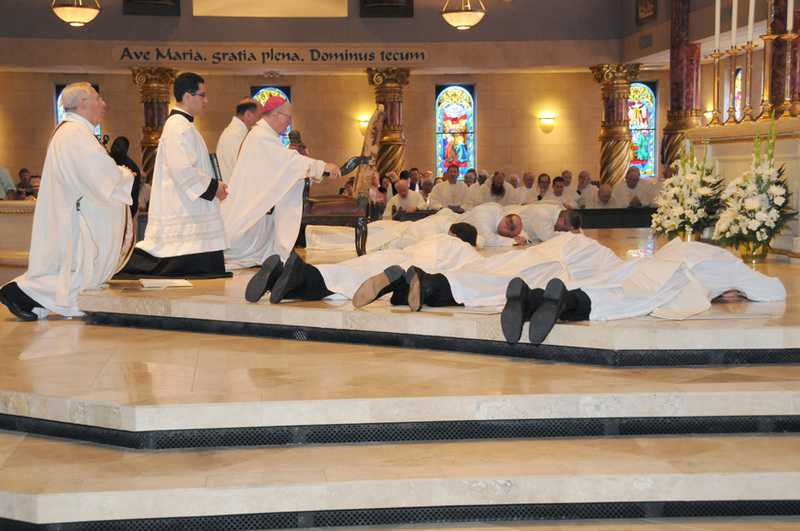 KELLER -- Under a huge dome with images of winged angels, six former Fort Worth-area Episcopal clergymen -- including a father and son -- lay facedown at a marble altar Saturday and were ordained as priests in the Roman Catholic Church. In what officials called a historic moment, Fort Worth Catholic Bishop Kevin Vann and other white-robed priests in the diocese laid hands on the priests at St. Elizabeth Ann Seton Catholic Church in Keller to welcome them. It was the first ordination class under Pope Benedict XVI's new Personal Ordinariate of the Chair of St. Peter, created Jan. 1 to allow Episcopal priests to be ordained as Catholic clergy and for Episcopal congregations to join the Roman Catholic Church. The tone of the article was respectful and the story arc supportive of the Catholic Church. And, yes, they were all once Episcopal priests -- but not since 2008. It would have been better to say that they left the Episcopal Church when the Episcopal Diocese of Fort Worth left the Episcopal Church in 2008. As an aside, the national Episcopal Church as since created a second Episcopal Diocese of Fort Worth for the small number of clergy and congregations that opposed the decision to leave and litigation is presently before the Texas Supreme Court to determine which is the true Episcopal Diocese of Fort Worth. When the six left the Episcopal Diocese of Fort Worth to become Roman Catholics in response to Pope Benedict XVI's offer of an Anglican ordinariate they left the Anglican Church of North America (ACNA) -- the conservative rival to the Episcopal Church. I would also add that the story is not as clear as it could be on the point of the "first ordination class". For readers who have not been following the ordinariate story, they might have assumed that this ordination to the priesthood was the first ordination for the ordinariate -- which is not true. The first ordination took place on 2 June 2012 in Mobile. The Fort Worth six were part of the first batch or class of new priests to be ordained, not the first priests to be ordained. Those minor quibbles aside, I was impressed the Star-Telegram presented the issues properly by allowing the subjects of this story to explain themselves. And what the subjects of this story told the Star-Telegram was that their decision to enter the Catholic Church was not motivated by anger with the innovations in doctrine and discipline made in recent years by the Episcopal Church. They had entered the Catholic Church because they had become convinced by the truth claims made by the Catholic Church. Steenson and the six men ordained opposed many of the changes in the Episcopal Church, including the ordination of gay priests and bishops. All emphasized, however, that those issues were not central in their decisions to convert. "Hopefully we understand that this is not just about being opposed to something," Steenson said. "If you were just opposed to something, you don't want to join the Catholic Church. It's a lot more than that." The Rev. Mark Cannaday said his ordination ends a long journey. "My decision had nothing to do with current issues," he said, adding that he has been drawn to elements of Catholicism for many years. The younger Hough said: "For me, it's not running away from something or saying the Episcopal Church is falling apart. My decision was going toward truth. To me, the current issues in the Episcopal Church are symptoms of a greater problem, and that was authority. There was no authority to say this was or was not part of Christian practice." A very common mistake made in the reporting about the Anglican ordinariate is the supposition that those who join the Catholic Church do so in protest to the actions of their former church -- be it the Episcopal Church or the ACNA. The Episcopal Church is not a monolithic nor uniform body. Those who are opposed to the recent actions of the church can be found inside the Episcopal Church or outside in the new Anglican Church of North America or other continuing Anglican groups. Some join other Protestant denominations while many simply stop going to church. As Fr. Christopher Stainbrook noted, becoming a Roman Catholic was "just a natural progression" for him. It could be argued that the article might have been improved by the addition of voices from the Episcopal or Anglican churches commenting on the decision to leave. If this had been a contentious decision it might have made sense to do so. However, Bishop Jack Iker of the ACNA-affiliated diocese has ruined this particular story angle by being gracious and affirming of the decision made by his six one-time priests. I've interviewed him a number of times on this issue -- and many others -- and he won't bite. I may be cynical but adding more affirming voices to the story from the priests' former church would be a bit too happy-clappy for me. Now if I could have found someone to say something unkind, that would have been different. Perhaps I am too close to the story to have an objective mind on this point -- what say you GetReligion readers? Would it have improved the story to have spread the circle wider to add non-Catholic voices? Or do you agree with me that the article did a fine job in stating the "coming home" theme and adding more would have not improved the story?